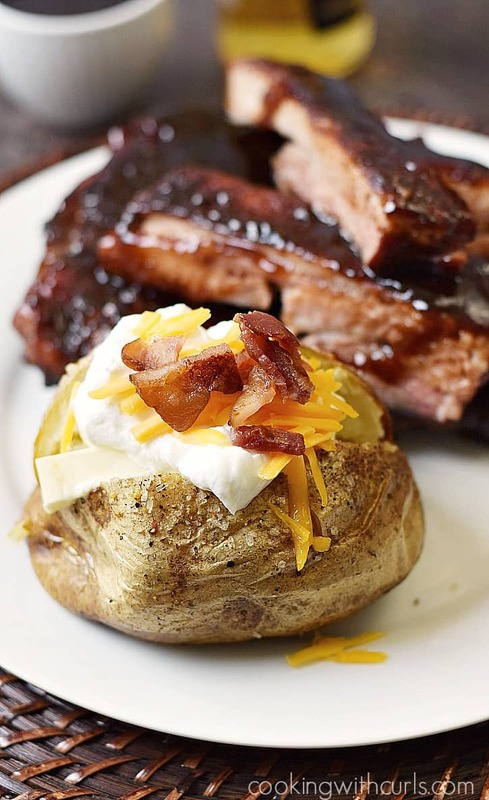 Have you ever wondered why restaurant baked potatoes taste so much better than the ones you make at home? I know why…..they aren’t baked in the microwave! Yes, I admit it, I am guilty of tossing potatoes into the microwave for 3 to 5 minutes because I am impatient. If you have the time, these restaurant-style Crispy Baked Potatoes are so worth it….. These restaurant-style Crispy Baked Potatoes may take some time to bake, but they couldn’t be simpler to prepare! 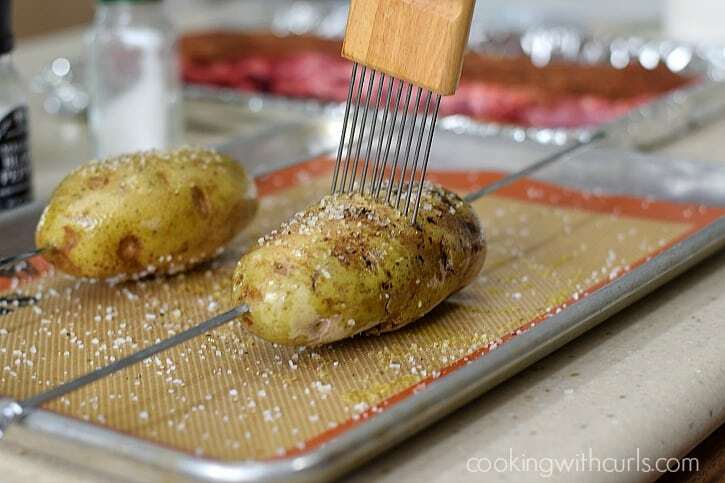 Slide a metal skewer through the center of each potato. 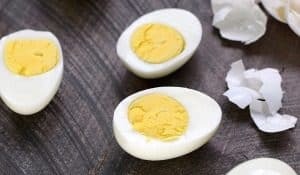 Rub each potato with olive oil and sprinkle with salt and pepper…..
Poke holes in each potato with a corn-cob holder, onion holder, or fork…..basically anything that will make holes! Place potato(es) on the center rack of oven. 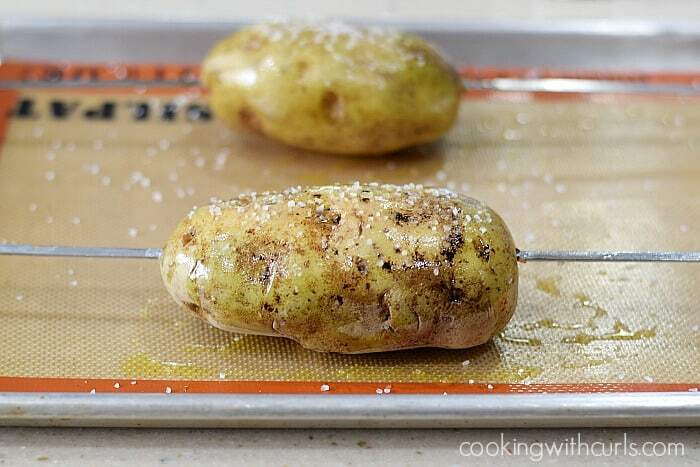 Place a baking sheet on the rack below to catch any drips…..
Bake potato(es) for 1 to 1 1/2 hours, until potato is cooked through….. 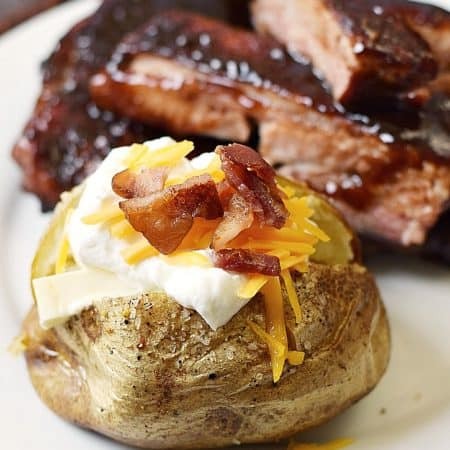 Remove skewer from potato and serve with your favorite toppings. Extra large potatoes will require a longer cooking time. You can make as many baked potatoes as you like, or that will fit in your oven. 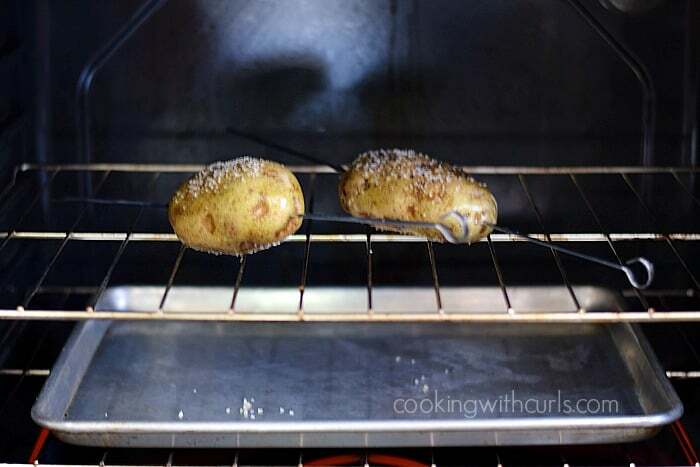 The metal skewer is placed in the center of the potato to help it cook more evenly. I can’t believe I forgot the chives!!! Make your own restaurant-style, Crispy Baked Potatoes at home and top them with your favorite toppings for the perfect side dish! Slide a skewer through the center of each potato. 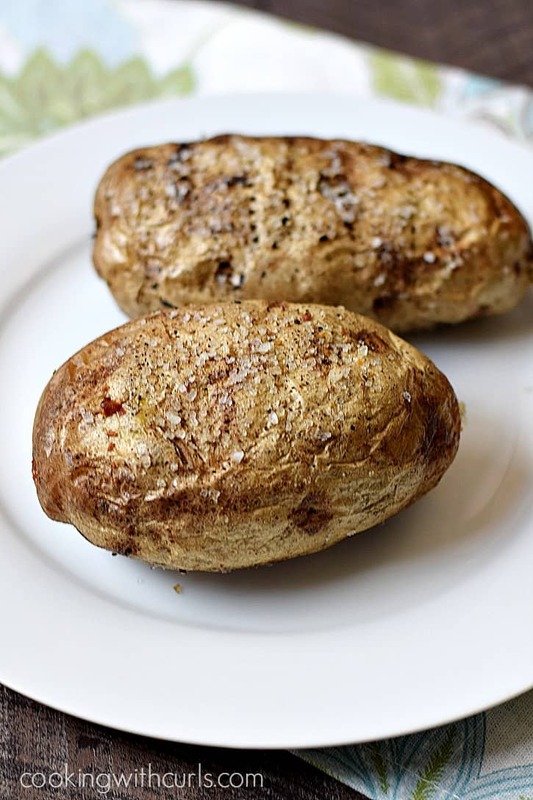 Rub each potato with olive oil and sprinkle with salt and pepper. Poke holes in each potato with a corn-cob holder, onion holder, or fork. Place potato(es) on the center rack of oven. Place a baking sheet on the rack below to catch any drips. Bake potato(es) for 1 to 1 1/2 hours, until potato is cooked through. 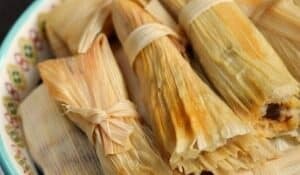 I finally got around to making these last night – YUM! 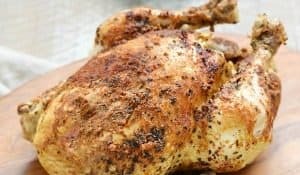 No more microwaving for me – it’s worth making the time to bake, like mom used to do, in the oven. These are even better than hers, because of the olive oil and crispy skin. The whole family enjoyed them! I used this method and it really turned out great. No guessing about the inside being done. Thanks. Would you do the same for a sweet potato? Although, I don’t think it’d need the long bake time.